The 2017 Athens Bar Show was a great success! The 2017 Athens Bar Show was a great success! The 2017 Athens Bar Show was a great success! 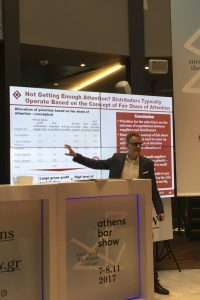 Since 2010, the Athens Bar Show has been an informative exhibition offering the opportunity for bar industry professionals to educate and learn from one another. This past Tuesday, Park Street CEO, Harry Kohlmann, spoke at the renowned show and offered expert insight with his presentation ‘Route to Market Strategies for Spirits in the U.S.’. The United States proves to be complex with varying state regulations and barriers to entry. This presentation provides development and execution strategies for entering key states within the U.S., addressing major topics, such as commercial and industry trends, strategic development and execution, US market industry insights, and distribution options. With over 8,000 attendees, The Athens Bar Show proves to be a successful platform for professionals to exchange ideas and improve the ever-growing bar industry.